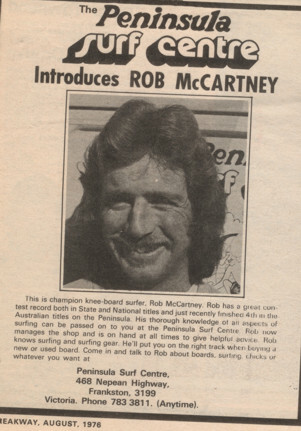 Rob McCartney is the only knee-boarder in the Hall of Fame and the only one likely to be ever included. In the 1970s Rob was a genuine knee-boarding champion, competing with arch-rival Neil Luke for the Victorian Championship year after year. The picture above is from 'Breakaway' Magazine, in August 1976, just after Rob had finished 4th in the Australian titles on the Peninsula.